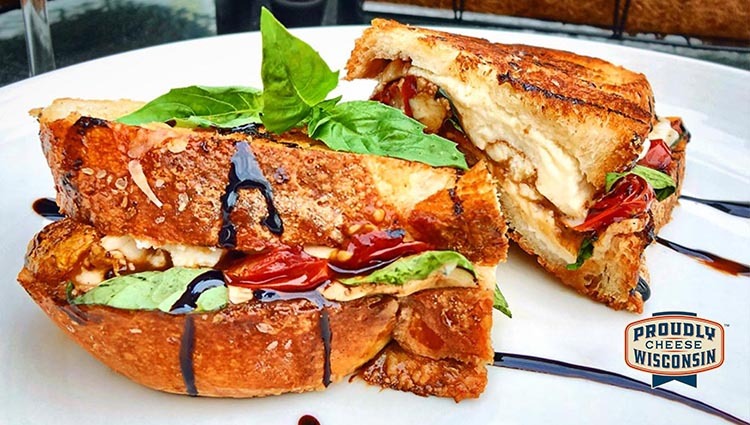 Enjoy sun-soaked caramelized tomatoes, basil, melted Wisconsin Fresh Mozzarella and Feta Cheeses all topped with a sweet balsamic glaze and a hint of spiciness. It’s truly a sea of flavor. Photo, copy and recipe copyright Dairy Farmers of Wisconsin. Add tomatoes, cut-side-down. Cook until starting to brown. Turn; cook until caramelized. Combine butter and red pepper flakes. Rub 1 side of each bread slice with cut side of garlic. Spread same side with butter mixture. Place 4 slices, buttered-side-down, in skillet over medium heat. Top each with 1 slice Mozzarella, tomatoes, Feta, onions, and basil; drizzle with balsamic glaze. Top with another Mozzarella slice and bread slice, buttered-side-up. Grill, turning once until bread is golden brown and cheese is melted. Garnish with basil sprigs, if desired.